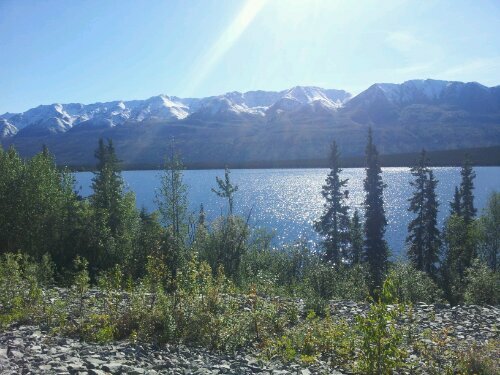 The 438 miles on the bicycle from Tok to Kluane Lake and on to Haines were on empty tarmac roads through rolling hills and mountain passes. Different to my previous adventures in Alaska where I have been on mostly dirt track in more remote areas, the miles passed easily and swiftly with a sense of relative safety (or so I thought). It seemed safer because I was on the main (albeit seemingly underused) arterial road from Alaska to Canada; also for the first time in nearly two months of cycling in Alaska I was not alone. 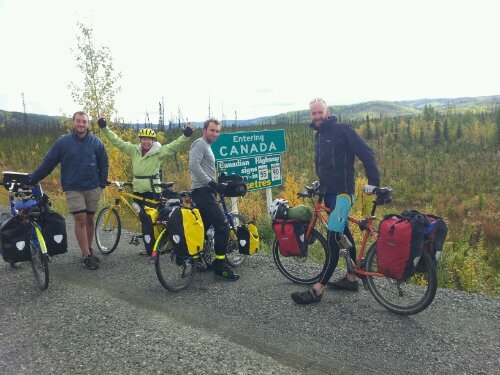 I met two lads in Tok on bicycles cycling south through Canada to Haines; Jesse and Neil. For those few days I immensely enjoyed their company and the temporary break of not camping alone; bears tend to be more scared of groups of people amongst other things but it was good to break up my journey a bit as well. After Haines we would be heading in different directions but for the next 438 miles we had the same goal so we cycled some of it together. Luckily for them (and me! ), they were joined by the mothers (Agnes and Connie) in a support car for some of the journey; both proved to be great value and it was fun getting to know them all. Jesse, Neil and I continued on together pushing out some reasonable miles in a bid to get south faster and outrun the inevitable winter. Some of the nights were below freezing and I often woke with frost on my tent, for some reason, causing major condensation in my new tent. We came across this golden (?) eagle on the side of the road; speculating it had probably been hit by a car. It barely moved when we approached it and seemed completely unflappable; a cool killing machine. One particular day we planned for a 125 km ride; progress was ok but perhaps slower than normal as we battled a non-trivial headwind. Right near the end of the day I broke a spoke on my rear wheel. With a front wheel this can be a relatively easy fix but it was my back wheel so the cogs / gears and disc brake rotor need to be removed. Jesse and Neil appeared round the corner as I sat down to work out how to use a fiddly little emergency tool that I’d never used to fix my problem. The instructions had indiscernible pictures indicating how to use it and the descriptive text was illegible as the paper had begun to fall apart. The sun was going down and the temperature rapidly dropping. 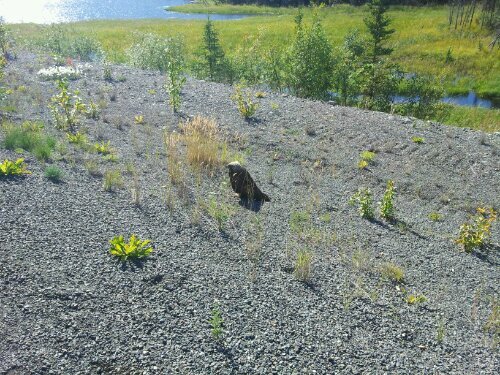 To make matters worse, the campsite that I had broken down next to (and I had originally planned to camp at) was closed due to dangerous grizzly bears; I had seen large footprints by the side of the road about a kilometre back. Someone explained to me that the berries were fermenting which in turn made the grizzlies effectively ‘drunk’ and more dangerous. For example, a week or so before a grizzly had killed another grizzly in front of a bus full of people in Denali National Park; possibly for this reason? Anyhow, the fix took two hours by which time it was fully dark and the moon out. Unable to stay where we were, we pressed on. Neil played his music through his speakers to scare off any potential bears; the incongruous music reminded me of a werewolf horror movie (except with bears). We rode by the full moon light next to the huge Kluane Lake and exceptional mountain backdrop; a memorable moment although filled with uncertainty. A few miles down the road, we came across a caravan (RV) park. Exhausted and concerned that my bike could fail again in a worse location, I split from Neil and Jesse; they had their mind focused on a motel 10 miles down the road (that turned out to be fictitious unfortunately for them; poor souls- thanks so much for waiting with me guys). Now normally I don’t mind camping solo in the wild but until I understood the risks from the bears in Canada I thought it’d be prudent to camp with others. So descending into Cottonwood Campground my heart sank when I saw a sign saying ‘no tenting’ due to high populations of dangerous grizzlies. It then read, ‘highest population of grizzlies in the whole of North America’. Suitably spooked I searched around the campground for the host who was nowhere to be seen. It was 11.30 p.m.; I then saw a sign saying if you arrive late please pay in the morning. I considered trying to catch up Jesse and Neil but decided they’d be long gone. I tried all the doors of the buildings; locked. I then found a small shed with no window full of junk; no room. After half an hour I felt a little bit desperate and then came across my saviour in the form of a German called Mark with his girlfriend Sabina. He kindly fed me some cheese and bread toasted on the fire and suggested I sleep in the laundry room. Much to my relief it turned out to be quite a suitable little spot; I’d have to risk the fury of the campground host in the morning but I had little choice. She actually turned out to be very nice (thanks Mary Anne! ); rested and showered I headed back on to the highway pretty happy with the way things had turned out. 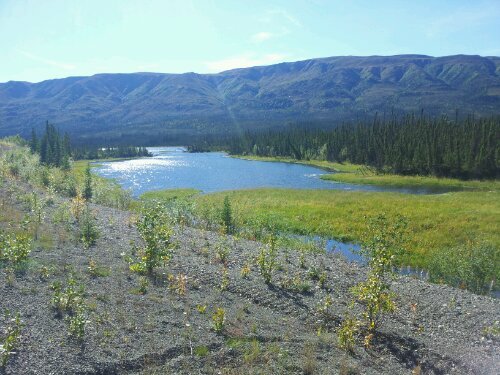 I can highly recommend Cottonwood campground situated right on Kluane Lake; very beautiful. ← Why did the bear rip up my tent? Hope you’ve conquered your mechanical problems and are in warmer country now. Really like you first hand info on bears – well done. We are in Vancouver with Carl’s family now. Warm and dry with no bears! Thanks Cathie! Yeah I’ve made it down to Jasper in Alberta. I’ve had great weather but it drops below zero at night and winter is definitely coming. I’ve been cycling further and faster each day in an effort to follow the fading sun. 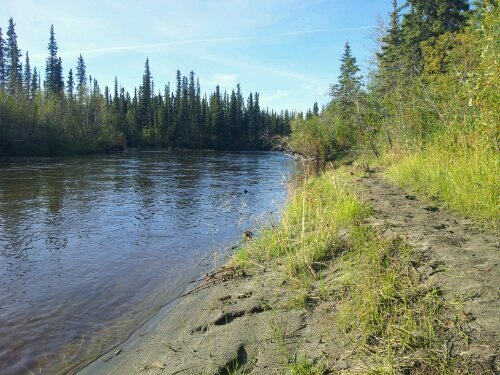 How was the rest of your trip, you went down the cassiar? Eek a grizzly killing a grizzly? Makes you realize what short work they could make of a person. Interesting that happened at Denali; could it have been the same bear that killed the hiker perhaps? I know! Grizzly ‘homicide’ – extraordinary. Not sure if it was the same one but guess it’s possible. I’d have thought they’d have mentioned it if that was the case. Think there are around 300 grizzlies in the park. I enjoyed reading this. Thanks for taking time from your trip to keep us all updated. I’m still hoping the snow in CO will scare you enough to take a detour to Utah for some redrock and great single track. Miss you laddy. Hope you’re eating enough (tried the Goo? ).